For the food connoisseur, nothing’s worse than going to a place to taste a culinary specialty and being served a poor example of it – as if you wouldn’t know the difference! Unfortunately, this is becoming more common in Italy, and the buongustaio must remain ever vigilant. 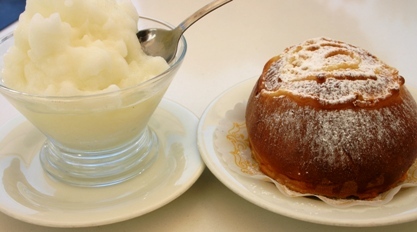 On a recent hot summer’s day in Modica, Sicily, I went in search of a refreshing lemon granita, served with a brioche. This is a traditional Sicilian breakfast and also common as a snack. I was dismayed to find that some stuff being passed off as granita is made from a mix, and that a good brioche is getting harder and harder to find. If you can see the granita spinning around in a machine, skip it and go somewhere else. This is not real granita and is often made with a packaged mix-what is Sicily coming to! Aside from being an affront to real granita, this ghastly mixture literally leaves a bad taste in your mouth, an overly sweet chemical taste that needs least 2 real granite to cancel it out. When you find a bar that has granita that must be scooped or spooned out of a a metal canister, things are looking up. Ask if it is made with real fresh lemon juice – spremuta di limone. If the answers is yes, order it. Fingers crossed that it is not too sweet. 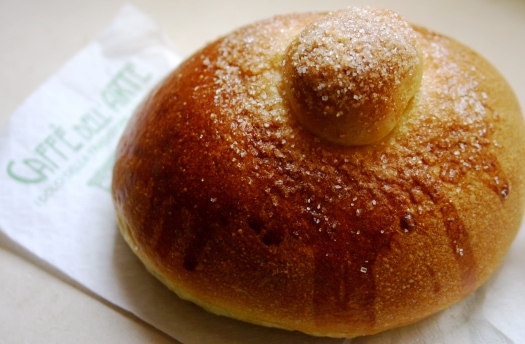 Just because you have found a good lemon granita, do not assume that the bar will also have good brioche. Unfortunately, most bars do not make their own and often buy cheap industrially made brioche that are gummy and tasteless. An aberration! A good brioche must be light and airy, yellow with eggs and fragrant of butter. Ask to at least see the brioche before ordering it. Here are the places that I have found to have the best lemon granita and brioche in the center of Modica. The Pasticceria di Lorenzo, at Corso Umberto 225, seems to be the only bakery in Modica Bassa that still makes their own brioche, but they don’t have granita. Still, the brioche are worth eating on their own, or stuff a few in your purse to have with a granita to go. Caffè dell’Arte at Corso Umberto 114, serves very good lemon granita and light homemade brioche. Hurray! Their brioche is pictured below. Caffè Martin on Corso Umberto across from the cathedral of San Pietro. Good lemon granita. They had run out of brioche so don’t know what they are like, but I suspect they are like the mass produced ones pictured with the granita above. Located at the atmospheric hotel Palazzo Failla, the excellent lemon granita and fragrant brioche are served with class. Everything comes from the same kitchen as the hotel’s 1-star Michelin restaurant, La Gazza Ladra. BUT update in July of 2011, we were served mass produced brioche rather than homemade. Hope this is temporary at Caffe Blandini. If you are too far away from any place serving good lemon granita, you can try to make your own. Here is a recipe for lemon granita from Sicily. We tried the lemon granita at Caffè dell’Arte 2 days ago & it was delicious. Thank you for your guide!